In an effort to give back to his alma mater, Middle Tennessee State University, Nic Dugger — President of Nashville-based TNDV: Television — has donated a complement of equipment to MTSU’s Department of Media Arts, one of several Bachelor of Science programs offered by the MTSU College of Media and Entertainment. TNDV Owner and MTSU c/o 2000 Grad Nic Dugger (L), MTSU Chief Engineer Marc Parrish (C), and MTSU Asst. Chief Engineer Mike Forbes (R) show off one of 2 new quadcopters donated to the college by Nashville based TNDV. The equipment package included: two DJI Inspire Series quadcopter drone systems — capable of transmitting live, 4K/HD video feeds from close to 1,000 feet in the air — and an Oculus Rift virtual reality system. 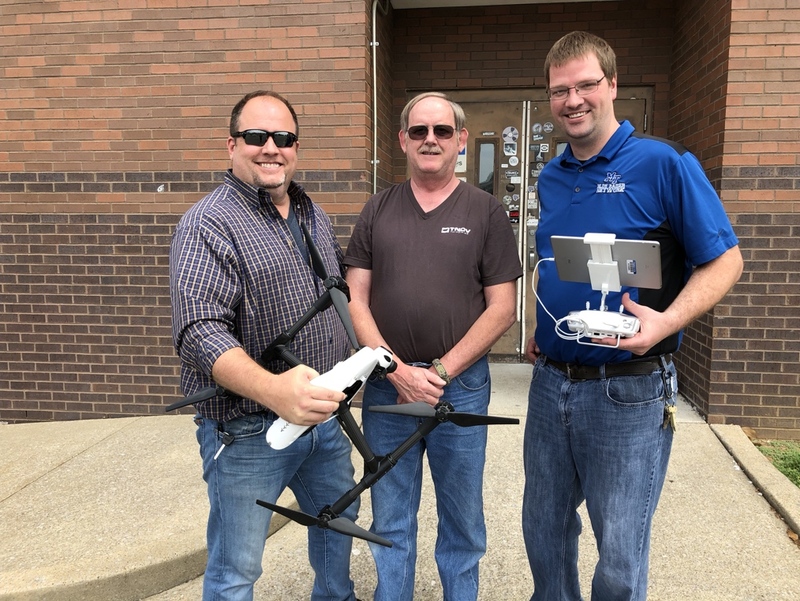 As a Class of 2000 graduate of MTSU’s Media Arts Program, Dugger believes that today’s students must learn to utilize live drone video feeds effectively to adequately prepare for today’s real-world remote production and truck jobs. As one of the most extensive creative media production programs in the region, MTSU invested $1.7 million in 2016/2017 to build a new 40-foot Mobile Production Lab that students regularly use to learn about producing live TV shows, such as MTSU athletics, music concerts, and other special events. Dugger donated the drones specifically to expand the mobile unit’s live production capabilities, including the capture and transmission of exciting live aerials and beauty shots, which can be combined with conventional tripod- and shoulder-mounted camera shots, and other live sources. While a student at MTSU, Dugger worked on the school’s previous HD truck, and has since built a successful career running a mobile production truck business of his own. TNDV has amassed a fleet of eight HD and 4K trucks, including MTSU’s original mobile unit now dubbed “TNDV: Inspiration”, and their latest 4K-capable 53-foot flagship unit, “TNDV: Exclamation”. The DJI Inspire drone system integrates a live HD camera, multiple remote controllers, battery charging devices, and video transmission. With a flight time of about 25 minutes, the quadcopter drone flies at speeds of about 90 to 100 kilometers per hour, while relaying 4K/HD 30fps (H.265) encoded video in real-time. The Oculus Rift Virtual Reality Platform includes all the hardware and software necessary to create an immersive VR experience. Dugger presented the equipment to MTSU Chief Engineer Marc Parrish and MTSU Assistant Chief Engineer Mike Forbes at the end of the spring semester, in mid-May 2018, to give the faculty members ample time to become familiar with their operation before the students returned for their fall semester.